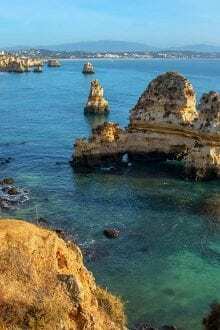 The Silver Coast in Portugal, or Costa de Prata, is a stunning stretch of coastal towns on the western side of Portugal, neighbouring the Atlantic Ocean. The region remains largely unknown and therefore untouched by tourism, meaning those who do visit can bask in the extraordinary “silver” sand. 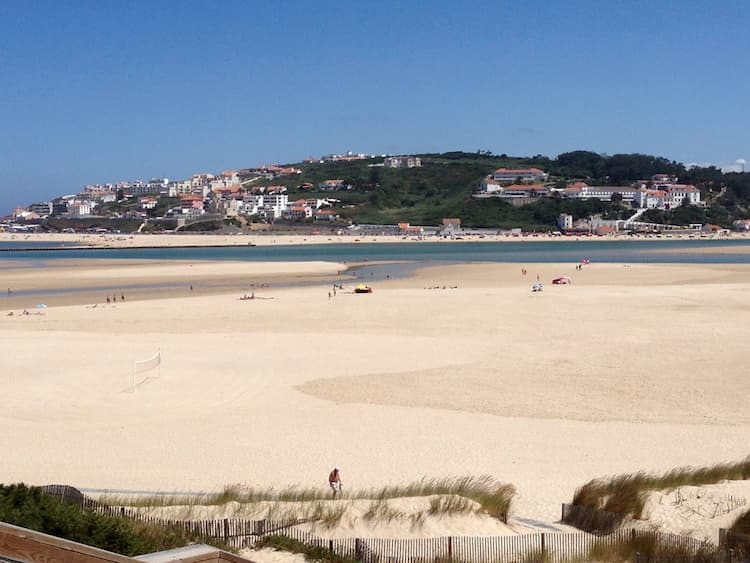 Read on for all about the Silver Coast in Portugal and why you should visit. Locals often refer to the Silver Coast as the Algarve of the north, and it certainly earns the title. 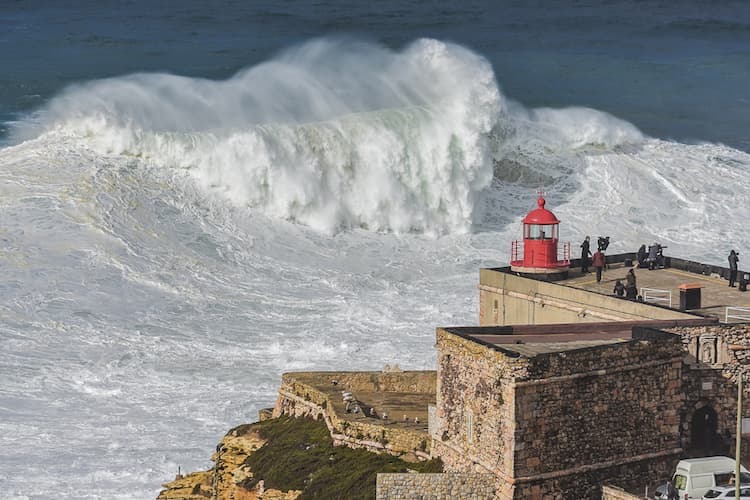 But the Silver Coast is not just sandy beaches; between Peniche and just south of Porto you’ll discover everything from mountain views, traditional Portuguese villages, some of Europe’s best golf courses, and friendly locals. The boundaries for the coastline are subject to some debate, but we can confirm that the Silver Coast stretches over 150km north of Lisbon, just missing Porto. And the area isn’t isolated to the coast but extends inland too. 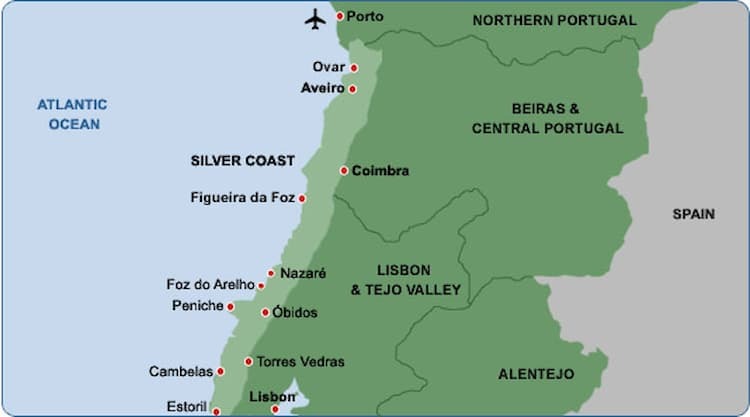 The Silver Coast incorporates cities like surf town Nazaré, historic towns like Tomar and Coimbra, and the mountain regions of Serra da Estrela. Portugal’s silver coast is made of many different villages and towns. Take a look at some of the most popular places. 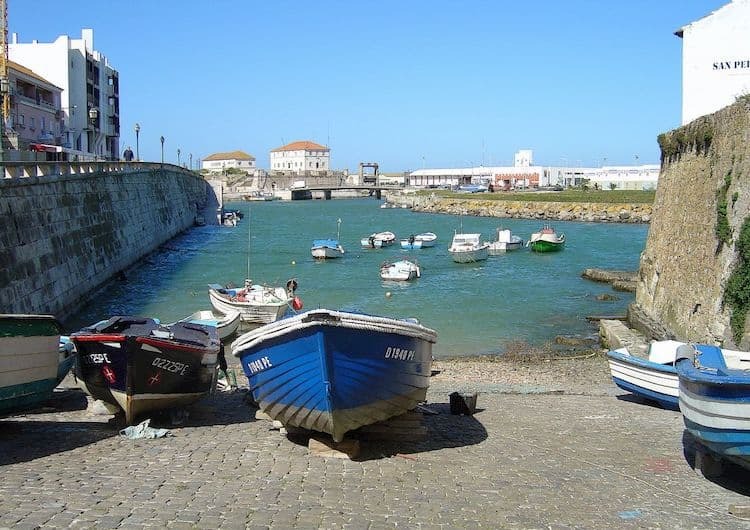 Peniche is a popular seaside location for surfers and outdoor enthusiasts. For history lovers, the seaside fort where Salazar’s regime detained political prisoners can be explored, while art lovers can admire the talented artisans specializing in handmade lace. Known for its gigantic waves and surf scene, Nazaré is a picturesque coastal resort filled with beach umbrellas in the summer months. The town isn’t all beach and waves, but also a popular destination over Carnival and New Year’s celebrations too. 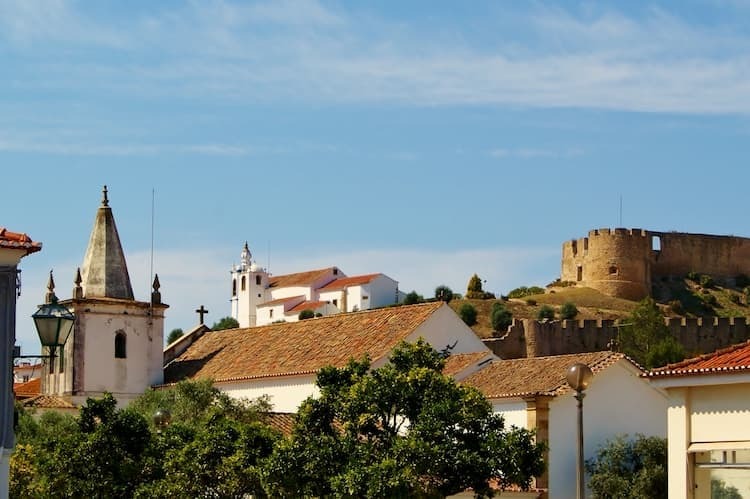 One of Portugal’s most traditional towns, Torres Vedras is a region linked strongly to wine, and surrounded by green hills and valleys. Locals venture up here to celebrate Carnival, where the celebrations are some of the biggest in the country. If you want to know more about this very particular Portuguese tradition, click here. Surrounded by a city wall, a walk through the city centre feels like a walk back in time. 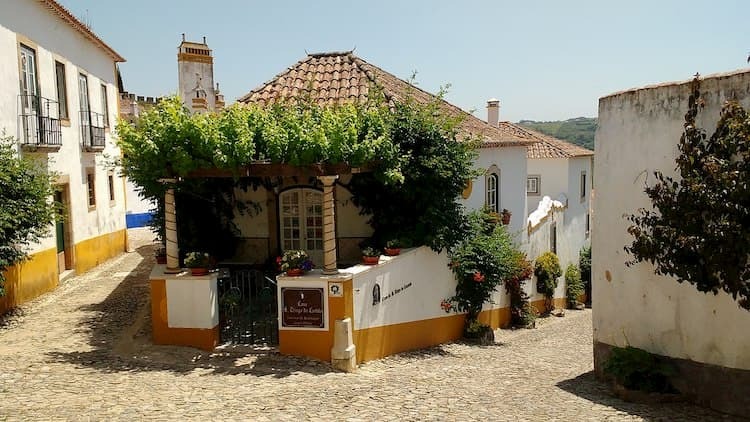 Óbidos is a historic village, decorated with cobblestone paths and whitewashed homes. It is a small peaceful town, definitely worth the stopover for a night away from the big cities. The region is characterized by the blessed Mediterranean weather that much of Portugal boasts year-round. The average temperature in the summer months reaches as high as 30 °C, while the average low drops to around 15 °C degrees in the winter months. 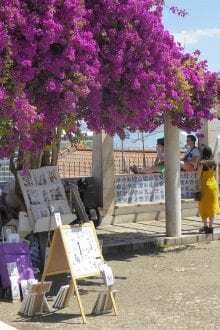 Are you looking for more ideas on what to do in Portugal? Make sure you sign-up to our newsletter. Of course, one can not and must not visit a town in Portugal without enjoying the fantastic gastronomies of each region. The fresh seafood along the Silver Coast is some of the finest in the country; my personal recommendation is Pangeia Restaurante, located on the hill above Nazaré, serving spectacular Portuguese cuisine. Other great restaurants are Dom José in Bombarral, o Tibino in Foz do Arelho and Tasquinha in Nazaré. If you’d like to know more about the Portuguese cuisine, make sure you check Typical Portuguese Food: Your Guide to Authentic Regional Cuisine. 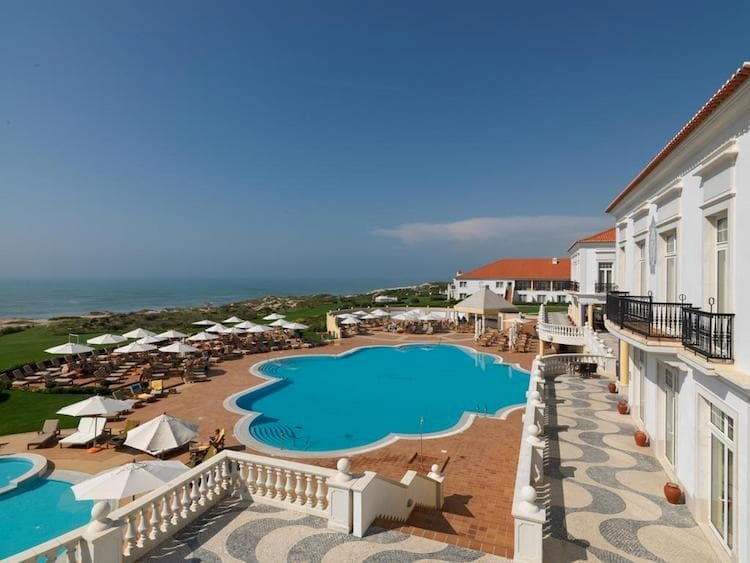 If you’re visiting the Silver Coast in Portugal, you can rest assured that there are plenty of hotels, hostels, and lodges to suit your fancy. If you’re looking for a hotel in this region, Booking has some really nice deals. Praia D’El Rey Marriott Golf & Beach Resort, 15 minutes away from Peniche is one of my favourites when I’m looking to splurge. 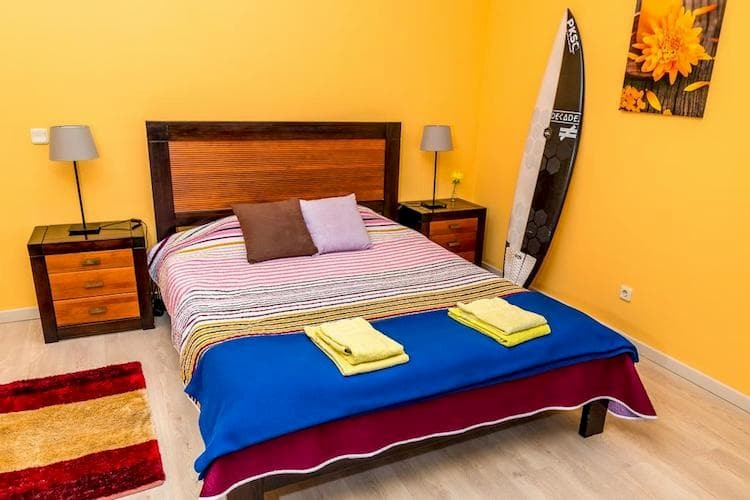 When I just want a nice but affordable place to stay I usually book a room at Peniche Beach Hostel. Situated between two major cities of Portugal, Lisbon and Porto, most of the towns on the Silver Coast are small, with residents living a slower pace than the big cities. 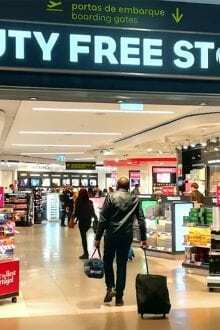 This can be ideal for a relaxing holiday and some even choose to live leisurely in one of these towns for much longer! The cost of living in the Silver Coast is a major reason many expats are moving to the region; offering exceptional value for money and high quality of life. Houses on the Silver Coast cost between €250,000 to €1m, while a two-bedroom apartment costs on average €70,000. Check out the prices on Rightmove or Idealista. 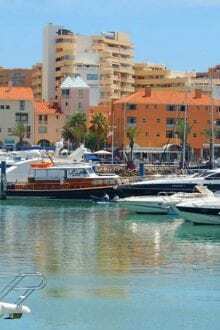 Expats looking for an alternative residence or holiday home to the Algarve, that is affordable and scenic, might find the Silver Coast, the perfect solution. 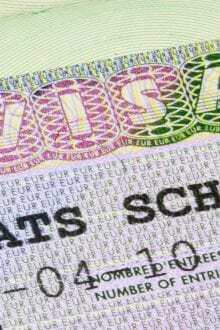 Read our article here to see what visa options you need to live in Portugal. Should you visit the Silver Coast in Portugal? The Silver Coast offers visitors and residents a great combination of relaxing and adventure-filled activities in Portugal. There is the best of local cuisine, medieval and coastal towns to explore, championship golf courses to play, and of course “silver” sandy beaches to enjoy the Portuguese sun.